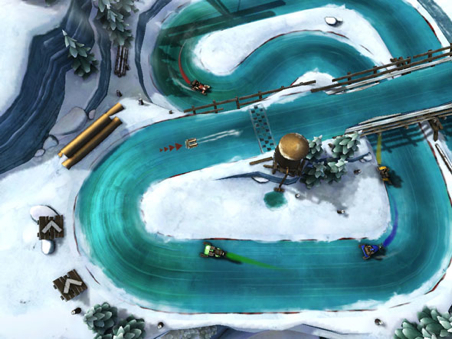 New racing game from Snowbolt Interactive appears to combine top-down racing fun with...Angry Birds? There's a new racing game around these parts that goes by the name of Slingshot Racing. Currently in development at Snowbolt Interactive, this intriguing iOS app lets users speed past the competition by latching onto objects and slinging their rides around each track. It's a bizarre-sounding concept that just might work. Unfortunately, there's no trailer to see this idea in action, or many details, for that matter. That said, there will be four-person simultaneous play using a single iPad, retina display support and leaderboards via Game Center. We're always in the mood for something different, and look forward to playing Slingshot Racing as soon as publisher Crescent Moon Games releases it.